The bad news is that New York City produces more than 10,500 tons of garbage daily. The good news is that over 30 percent of that garbage is suitable for composting. In fact, 200 tons of organic waste is composted per year at a remarkable “slow compost” operation in Red Hook. BBG now oversees a large-scale composting operation at Red Hook Community Farm—where our partner Added Value grows food. The project, part of the NYC Compost Project hosted by Brooklyn Botanic Garden, is run entirely on renewable resources (solar and wind) and is the largest of its kind in the United State. More than 2,000 people help in the compost effort. Volunteers, students in the farm’s youth program, and the community at large help create a sustainable, urban “closed loop.” Crops are harvested and sold to neighbors, who then bring their food scraps back for the compost pile. More material, collected from the Compost Project’s convenient community drop-off sites, gets added to the mix. Finished, sifted compost rich in nitrogen and other nutrients then goes back to the farm’s fields to grow more food for the community. And so the loop continues. 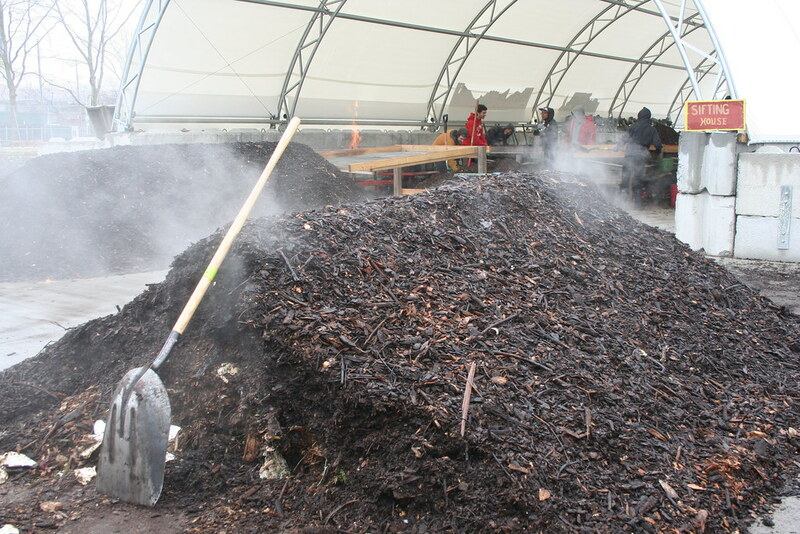 Such large-scale composting is done using windrows, tall, elongated mounds that enhance hot (“thermophilic”) decomposition. Microbes, hard at work within the mounds, generate the heat, which makes impressive steam clouds—always fun to see on winter days. There's no denying that sticking with renewable resources means a lot elbow grease with pitchforks and shovels. But it is incredibly satisfying work. Not only do we divert organics from landfills and produce compost, we dig in and work together in the most environmentally friendly way possible. “Slow compost,” like slow food, reminds us that everyone is a player in this natural, sustainable loop. That makes it meaningful and educational for everyone involved. David Buckel is Senior Organics Recovery Coordinator for the NYC Compost Project Hosted by Brooklyn Botanic Garden. 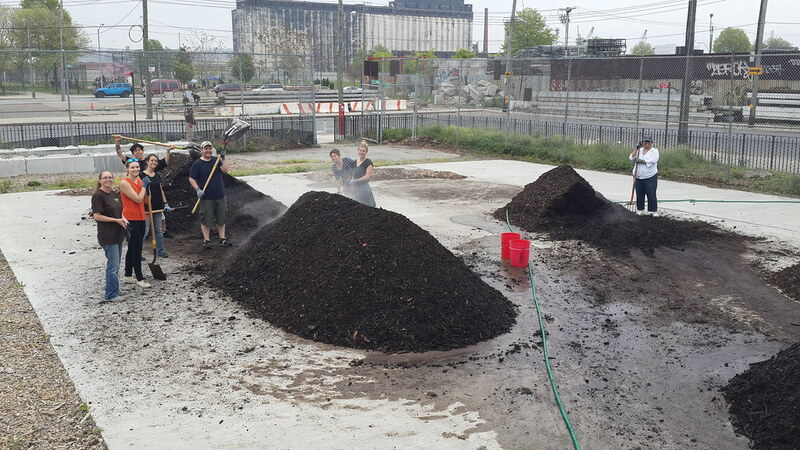 The handmade compost at our Red Hook site is used on the adjacent urban farm operated by Added Value and for other greening projects around Brooklyn, like community gardens and schools. Learn how to make your own compost by taking a composting workshop offered here at BBG, or learn about resources for community composters through our Technical Assistance page. Can people get some of the compost? Thousands of volunteers help compost happen at Red Hook Community Farm. Photo by NYC Compost Project staff. Composting in large windrows encourages thermophilic decomposition. Photo by NYC Compost Project staff.